today for free estimates on electrical repairs and service. Welcome to Brighton Electric ! We are the leading electricians in your area, here to service all of your electrical needs 24 hours a day, 7 days a week. Our electricians specialize in all types of electrical installations, repairs and maintenance. You can trust our licensed, professional experts. On Time Service Guaranteed – Or your service call is free! 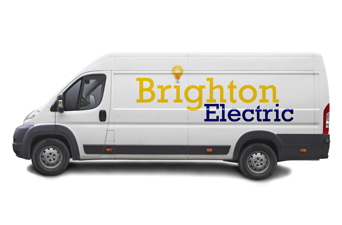 Brighton Electric is your local “Warehouse on Wheels.” Our trucks are packed with any and all supplies we will need to complete your repair or installation. Our fully stocked trucks give us a competitive advantage by allowing us to get to you faster, and provide you with the most efficient electrical service possible. If you have seen our trucks around town, you’re not alone. It’s likely that we’re in your neighborhood now. Brighton electricians are standing by, ready to save the day! Take a look at our service area! The Electricians You Can Count On! It is our goal to maximize the comfort and convenience of your life by ensuring the best products, services, and technicians to handle any electrical problem you may have. We proudly serve all of South Florida . Check out what your neighbors are saying about us! Call Brighton Electric today for the best electrical service: 866-893-8009. You can also contact our knowledgeable electricians online with any questions you may have.